Recently I was asked: “What is your most prized possession?” It felt like a strange question. I have a lot of things that are important to me—some family heirloom jewelry and dishes, the gifts my husband and children have given me over the years, my children’s artwork—come to mind. But they are important to me not so much as possessions, rather because of the love and connections to the people behind the gifts. They remind me of our family history, often they are associated with a particular place and time filled with special memories. But when I think of a possession I really treasure, my thoughts drift to the contents of a small box of photos and letters in the back of my closet. I wrote about them once beforehere on Gathering Flavors. 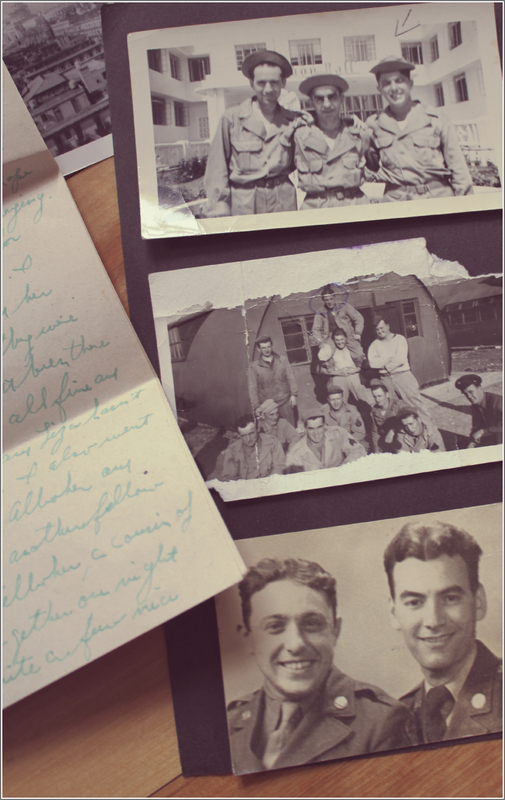 They include letters and photos my father, Abraham Mordecai Testa, sent home during World War II to his family. He was one of eight children. He and his two older brothers were stationed overseas, while his youngest siblings—all still in grade school—were home. The letters he wrote were filled with joy and optimism. There was a particularly beautiful description of Bastille Day and of my father’s visit to extended family on the outskirts of Paris. 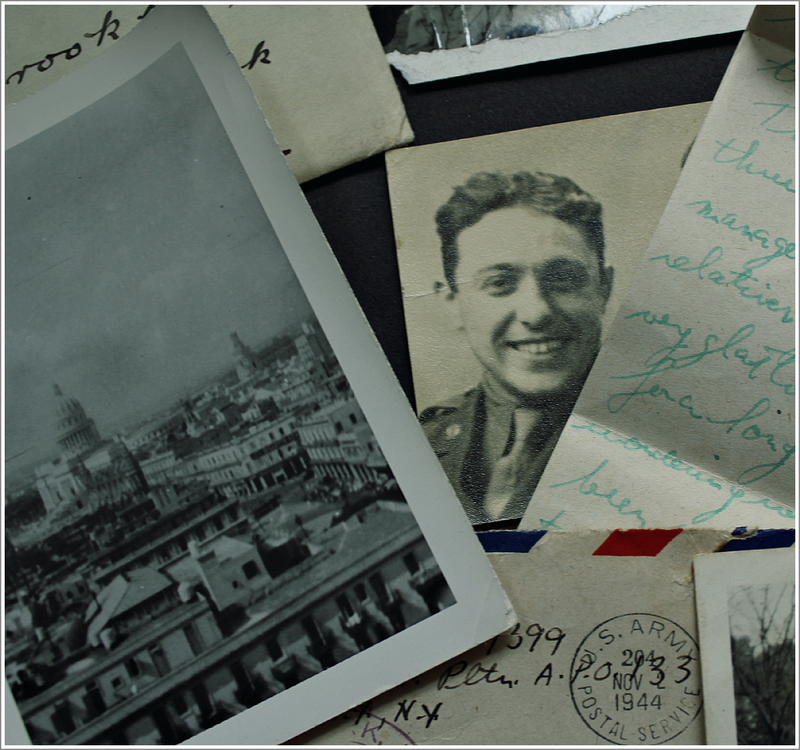 I was struck at how he was at war, but his letters didn’t speak of the dangers he faced. He wrote home in such a way as to reassure and protect the family he’d left behind, rather than to dwell on the painful reality. My father was a fireman in the U.S Army's air brigade. It was his job it was to rush to the scene of crashed fighters in hopes of saving the people within. While the letters implied nothing unusual about his visit with his French cousins, these people were actually in hiding from the Nazi’s. He put his life in danger by leaving his base dressed in civilian clothes on more than one occasion—posing as a Frenchman—to bring them whatever food, clothing and money he could put together to aid in their survival. These were not stories he bragged about. When he spoke of the war, he was inclined to tell stories about good times his buddies. These men became lifelong friends. I only learned about them later in life, long after he died in 1966. When we moved to New England, I reconnected with his youngest brother Sam and Sam's wife Jean. It was Jean who gave me the box when Sam died. Amongst the letters was a surprise: a letter not written by my father. Rather, it was from the family whose lives he helped save, addressed to my grandparents, telling them what a fine young man their son was. Thanks in part to my father, they survived the Holocaust and rebuilt their lives using the money and clothing he continued to send them long after the war ended. The contents of my box of treasures came to mind last week. It happened that the 48th anniversary of my father’s death fell on the eve of Holocaust Remembrance Day. It was also at a time when I was participating in a spring cleanse. Guided on the principles of Ayurveda, I joined a group of 15 women, under the supervision of Susan Reade and Michele George, in eating plant-based foods for 8 days. I’ve written about this process herebefore, as well. But during previous cleanses I focused on the foods and their physical benefits to my body, which are huge. This season, it felt more like a spring cleaning of my soul. One of the fears I have harbored all my life is that because my father died when I was just a little girl, my memories of him were not whole. I was not fully formed when I lost him, so how could my memories of him be fully formed? I didn't get to know him and see him through the prism of adulthood until I opened that box of letters. Now, I hold keep my childhood memories while forming an adult relationship with him through his words and images. Through the contents of this box, I introduced him to his son-in-law and grandchildren. My son, Clark Abraham, knows a bit more about the man for whom he was named. I am able to sweep my fears away like dust behind the bookshelves. I cleanse my soul. 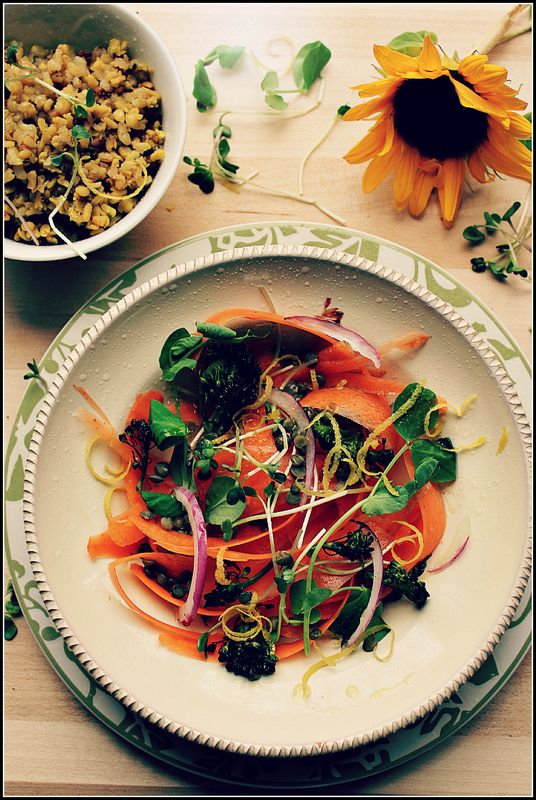 This Carrot Salad with Broccoli, French Lentils and Delicate Greens is one dish I made as part of my cleanse meals. 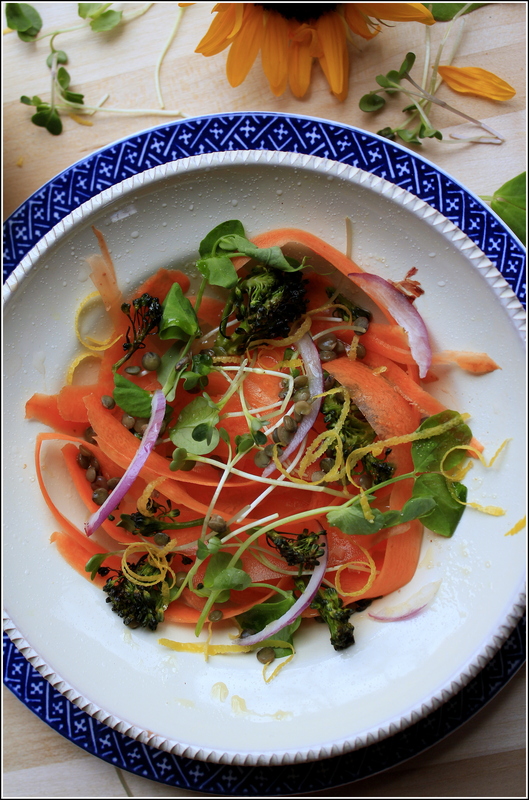 Naturally sweet, fresh carrots are shaved into thin strips, tossed with the cooked lentils and roasted broccoli, then sprinkled with fresh lemon juice and olive oil. I enjoyed it withkitchari during the cleanse period, but hope to have it again post-cleanse with some steamed rice and chopped eggs or grilled chicken strips on top. Put the lentils in a pot with water and bring to a gentle boil over medium-high heat. Reduce the heat to a simmer and cook, uncovered, until the lentils are tender, 15 to 20 minutes. Drain the lentils and set aside to cool. Preheat oven to 400 degrees F. Place the broccoli florets on a half sheet pan or pie plate. Drizzle with olive oil and place in oven. Roast until browned, about 5 to 10 minutes. Remove from oven and set aside to cool. Using a vegetable peeler, peel the carrots. Rest the bottom of one of the peeled carrots on a cutting board. Starting at the skinny tip of the carrot, press firmly down the length of the carrot with the vegetable peeler to create thick shavings. Repeat with the remaining carrots. Place the carrot shavings in a large mixing bowl. 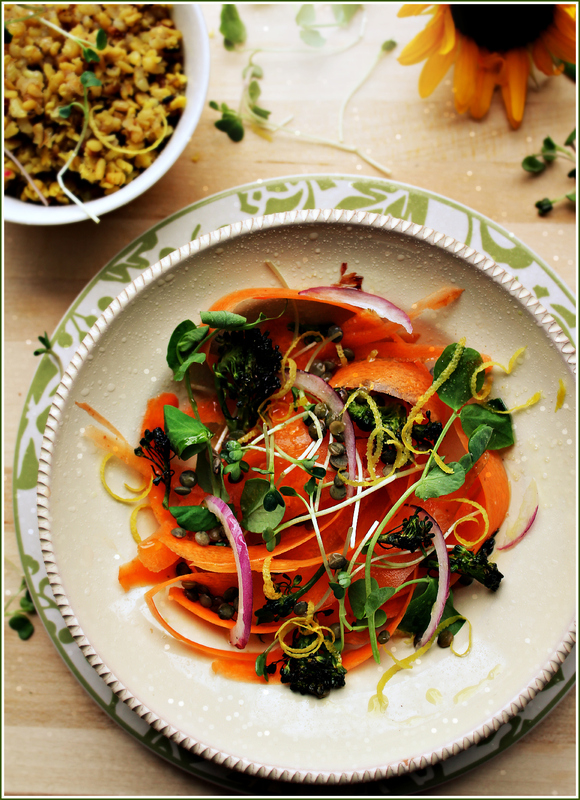 Add the cooked lentils, broccoli florets, pea shoots, radish greens and sliced onion. Toss all the ingredients together. To serve, divide the vegetable mixture between 4 salad plates. Sprinkle the lemon zest on top of each salad, dividing it evenly between the plates. Drizzle each salad with olive oil and lemon juice. Sprinkle with sea salt and freshly ground black pepper, to taste. 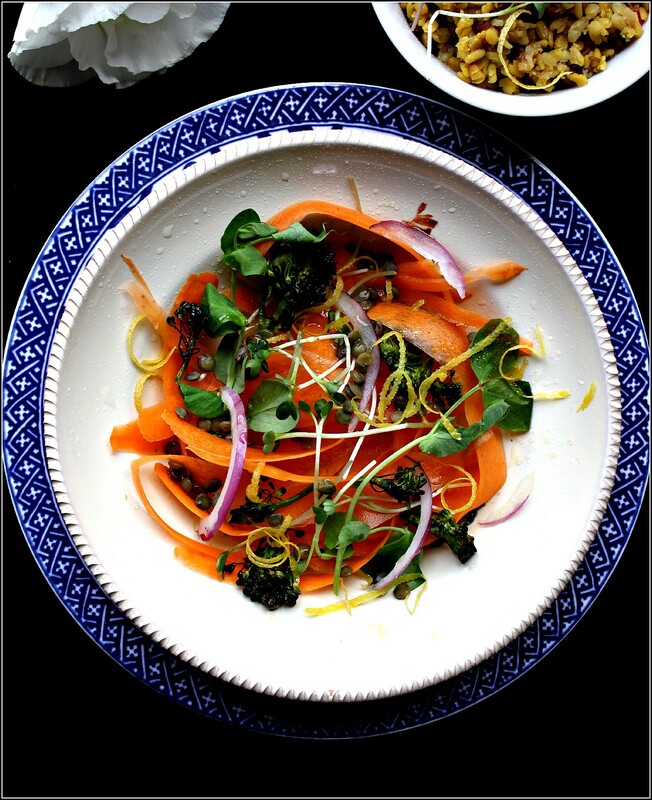 This recipe was closely adapted from The Sprouted Kitchen Cookbookby Sarah Forte and Hugh Forte. Their recipe included a tahini dressing. To use their dressing, add the following ingredients to a small bowl, then whisk together: ¼ cup tahini, 1 tablespoon extra-virgin olive oil, 2 tablespoons agave nectar, 3 tablespoons freshly squeezed lemon juice or apple cider vinegar, ½ teaspoon sea salt, ½ teaspoon freshly ground black pepper and water as needed. For a full meal, serve this salad with Kitchari or Brown Rice Pilaf with Braised GreensandCucumber Relish. Click here to see photos of other foods from the cleanse period.